It is Thursday, the end of the work week here in Amman, Jordan. I have been in the country eight days and have finished a full week here around the office. 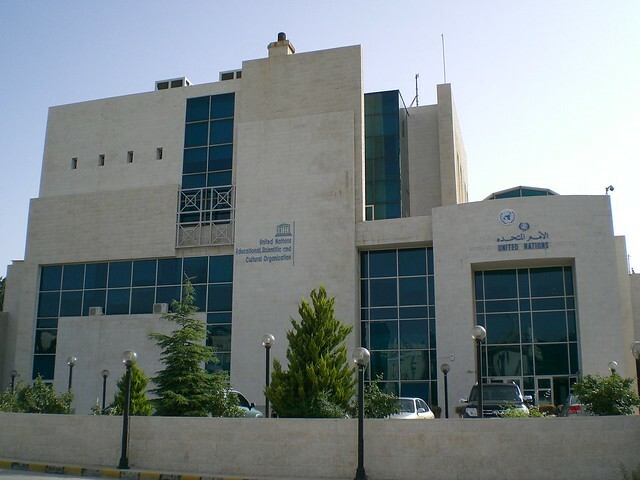 The UNESCO office is located right next to the University of Jordan and houses not only UNESCO offices but also the UNDP and UNFPA as well. I think I expected to jump right into work as soon as I arrived, so it took a few days to adjust my attitude and expectations to the slower pace of the office. On the first day I was introduced to most of the staff. The Education sector of UNESCO – Amman is small: one program director, one assistant officer, a volunteer and me. By mid-July, however, the office should be growing as three more program directors will be hired to begin working on the non-formal and informal education programs for Syrian refugees in Jordan, funded by a big grant from the EU. By the end of my second day I received a laptop, was set up with an UNESCO email, and met with the program director to discuss my work plan in more detail. I will be conducting an implementation and impact evaluation on the non-formal education program that UNESCO funded in 2011-2012 in a small Bedouin community called Umm Sayhoun near Petra with staff members from Questscope, a partner organization. 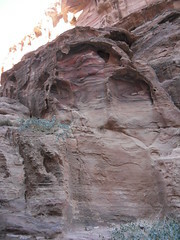 From what I’ve read, it is common for many of the kids from that community to work in the tourist trade related to Petra during normal school hours. The actual program was designed and implemented by Questscope. The organization got its start in 1988 providing non-formal education for dropouts and incarcerated kids in Jordan. The nonformal education programs have also been implemented in various urban centers throughout Amman and seven other cities throughout the country. With the grant money from the EU, Questscope and UNESCO will be redoubling their efforts at these centers and establishing more centers to address the increasing need. The second half of this week I sifted through various updates and reports sitting around here in the UNESCO office to familiarize myself with the project and to prepare for my first meeting with the staff at Questscope, which was yesterday. There, I met with the country director, the NFE project manager, and the education specialist. I learned more about the details of the nonformal education program, which is based on a Frierean, student-centered methodology, the basic structure of the program, the challenges currently facing the program in Umm Sayhoun, and how they are moving forward in expanding the project to more centers around the country to provide services to more out of school Syrian and Jordanian youths. I will be visiting and observing a number of the nonformal education centers around Amman in addition to the center in Umm Sayhoun. As I understand it, the NFE programs are a partnership between Questscope and the Ministry of Education, funded by UNESCO. UNESCO received a grant in 2011 to provide nonformal education to kids in the Umm Sayhoun project, but once the grant was done in August 2012, the Ministry of Education took over funding the project, but at much lower levels, and the program got put on the back burner. This year, only 4 girls and 10 boys participated in the NFE program at Umm Sayhoun, compared to 40 boys and 40 girls as participants during the 2011-2012 year. Thanks to the big EU grant, the program is full steam ahead for the 2013-2014 year. Next weekend I will be attending the training sessions for the people who serve as liaisons between the Ministry of Education and the facilitators of the NFE centers. The Questscope team mentioned the liaisons as the biggest challenge to the NFE program: they are generally have no training related to nonformal education, do not see the value in a methodology based on Frierean principles, and do not respect or know about the various roles the program facilitators play. It will be a great way for me to get trained on the program too, and it will be held in Aqaba, on the Red Sea!